For a time, I headed an animal welfare organization called Whidbey Animals’ Improvement Foundation (WAIF) on Whidbey Island in the Northwest. The work could be tough in the face of limited resources and especially as you saw the faces of animals clearly abused or abandoned when they are brought to the shelter. Yet my involvement had a profound impact on my life. I am especially in awe of WAIF’s amazing staff and volunteers who worked tirelessly to help unwanted animals find a home. They are the wealth of the organization. Pit bulls are not an uncommon reality to shelter life. Issues of their ban in housing, for example, increase the odds they will be at a shelter sometime during the course of their lives. In other circumstances, an owner may not understand what is needed for this dog’s care, or any dog’s care for that matter. In some cases, it is animal control who brings in the breed as a result of abuse in the hands of their owner who is raising the dog to fight. These strong, loyal and smart animals are like any other dog—they are products of those who raise them. The stories I have encountered would make you shudder and the cruelty some have endured would make you cry. Which leads me to Harry the Pit Bull. His face melted my heart when I first saw it. He wants what most creatures want — a good meal, lots of love, a place to play and call home. 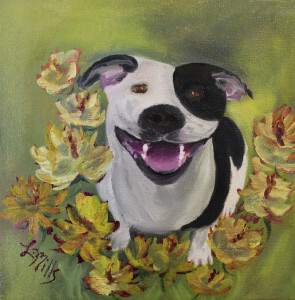 In this painting, Harry is a happy boy who tells us that even dogs can smile if given the chance. Enjoy! Such a nice post and painting too. It’s sad pit bulls get such a bad reputation. We think our Cody may be part pit and he’s a very sweet, loving and protective dog. You are so right — like with any dog (or child, for that matter), it’s how you raise it. Join Merlin's mailing list to receive behind the scenes updates subscriber-only content.